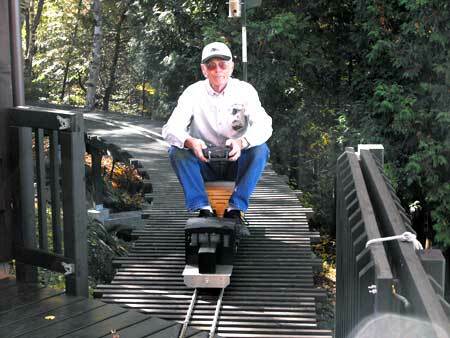 Below are live steam pictures taken on Clive Morgan's garden railroad in Lion's Head on the Bruce Peninsula, Ontario, Canada in October, 2008. You can tell it's autumn in Canada by the leaves on the ground and the colors of the trees. 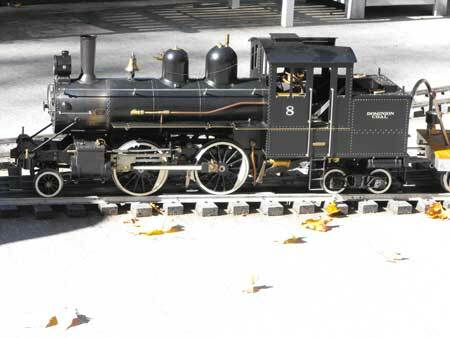 The leaves don't bother Clive's 1 inch to the foot live steam locomotives. 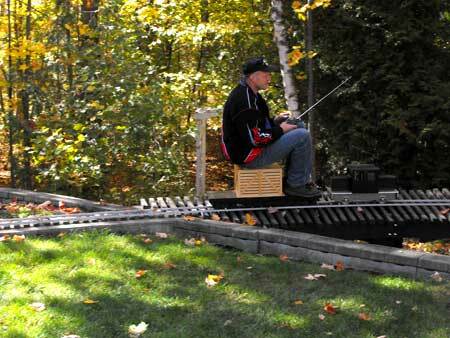 Clive has built a loop of track that circles his house that overlooks Georgian Bay. He had to construct a trestle across a large portion of the property due to the slope of the land. 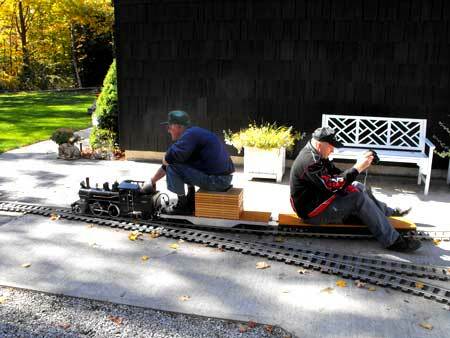 He also built the track into the deck on the back of the house. 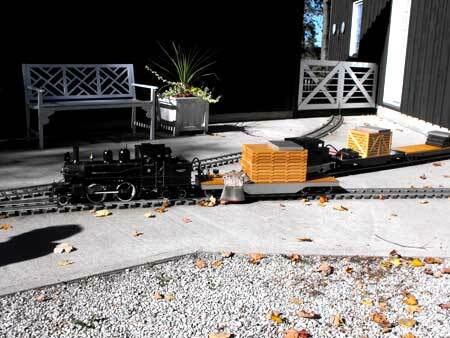 There are several turnouts built into the pavement at the front of the house by the driveway where he can park and set up his trains. He has two steam engines shown in these live steam pictures, Dominion Coal #8 and a British LNER locomotive, the Springbok 4-6-0 #8301. On the day we visited the LNER locomotive had been hoisted into its winter storage site inside Clive's workshop adjacent to the house. 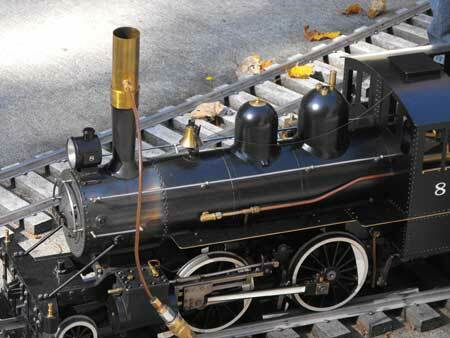 Although the Dominion Coal #8 was originally fired by coal like its namesake, Clive has converted it and the 4-6-0 to be fired by propane. 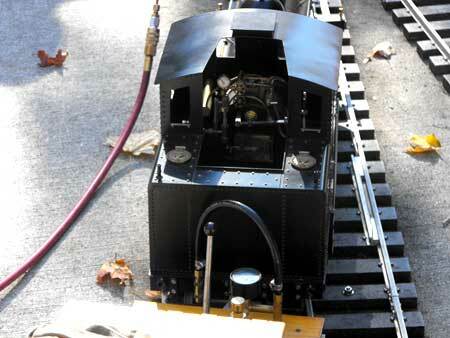 The propane tank is under the seat on the flat car that trails the locomotive. Distilled water is used in the boiler. I had met Clive at the Holland Centre train show when our Nottawasaga Club's traveling HO scale layout was on display. There are several other photos on that page. At the time Clive was also building a a 44-tonner diesel locomotive that is powered by a 12 volt battery and operated by radio control. The battery is housed under the seat on the trailing flat car. Clive is an electrical engineer by background and has experimented with a number of radio control systems for both his railroad and Brian Swanton's G-scale layout several streets away in Lion's Head. 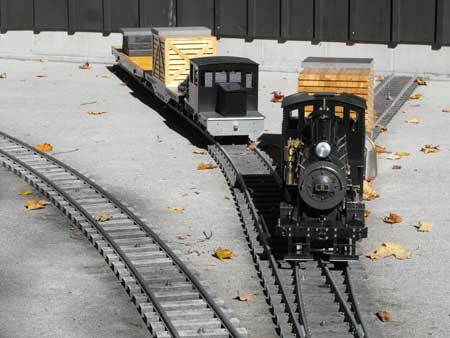 Here are some live steam pictures of Clive's garden railroad. Click on the thumbnails for a larger view. Here is a short video I took that day of Clive's railroad. The first clips are of the propane-powered live steam and the last clips are of the radio-controlled, battery operated diesel Clive is building. Fellow Nottawasaga member, Bill Payne, is controlling the diesel while Clive runs the live steam. He has the heat-resistant gloves! More train photos can be accessed through my train photos overview page. Return from "live-steam-pictures" to my Home Page.